Early in the week we noticed that a branch had broken off one of neighbor Dave's black walnut trees and had gotten hung up on the telephone wire that runs along the property line in the back yards. We minded our own, and I hadn't seen Dave out to talk to him, but last night he came over to tell us of his futility in trying to get a hold of someone from the phone company and asked for my help. So, of course, I helped him out. This morning before the Badger game we got out there and got it down safely. He had a long pruning saw which I used to cut off the branch a few inches to the right of the wire, as seen in the picture. After that, all it took was a little twisting and I got it to come down without damaging anything. I wasn't sure exactly how it would turn out, but it couldn't have gone better. And now I have some more cheap firewood for next year! Just found this and either I share it now, this late in the day, or wait a whole week. --When I think about it like that, it means I'm over the hump! Weather-wise it has been pretty moderate the last few weeks. We have been able to keep the windows open day and night comfortably, yet there has been very little rain. Not as bad as last year's drought, but I may have to break down and use the sprinkler I bought this past Spring. And starting today the heat rolls back in, so we got that going for us. Yeah. My upcoming project for my upcoming vacation: A cat bathroom. Our two cats, Hamish and Basil, have no fear of the basement like our late cat, Puddy, so they have no problem with their cat box being downstairs. The problem is that even though we have a tray outside the covered litter box, litter still gets on the floor in the area. Daily cleanings and sweeping generally keep the mess in control, but when we get a good rain spell for more than a few days water sometimes seeps into the basement and makes the floor wet, resulting in a messy floor in that area and dirty cat paw prints that amazingly can show up all throughout the house. It is my big vacation project this year, along with some other basement maintenance to be mentioned later. Yes, there should be no shortage of posts in early to mid September! The Packers play their last preseason game on Thursday, at the Kansas City Chiefs. The Badgers start their season on Saturday against UMass. I came across this the other day and thought it was cute enough to share. NSFW, of course. I will have a new post here and over at the garden site this weekend. I've been busy at work and tired at home recently. The Packers play tonight and I have things I want to do before the game, mostly reading and unwinding, so this is just a quick 'I'm still alive' post. 'Cause, you know, I'm just that kind of a**hole. Among other kinds -- watch the video! Happy Friday, everyone! I haven't been around here much lately because I have been tired, in the brain. I am in training at work, the most intensive training I have had in a long time, but I am hoping this will greatly help me in the future. It is almost all on computer and I do not have any access yet so I have been mostly sitting with my supervisor getting everything but the kitchen sink thrown at me. Actually, though she is trying to teach me a lot all at once, she is very nice, patient and I am learning a lot from her. I'm not overwhelmed with the work she wants me to be able to do - I know I'll get it down eventually - but I am concerned about just how high her hopes are for me. The higher the hopes the more pressure I'll feel. After all, I'm a former construction and lumberyard guy and she's teaching me the 'brainiac' stuff, her term not mine. It has been quite a change but, like I said, I hope this can really help me in the future. I keep mentioning that because this promotion is possibly temporary before I will be promoted again to go to a less desirable position. At least I have a good job now, but who knows? There has been much change at work recently so anything can happen, and I hope it does. 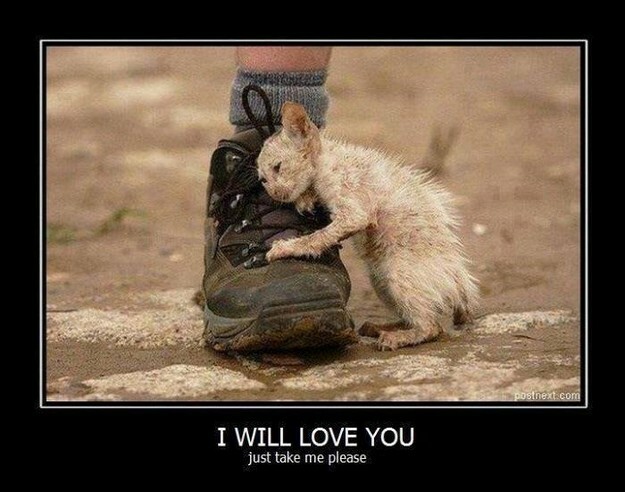 Is this not the saddest kitty pic ever? So this "undercover" cop car has been parked out front for a couple hours now. It was here for a bit when my wife noticed it, then it left for a bit, and shortly came back and parked in the same spot except now there appeared to be a pizza box in the front seat. I finally dared to take a picture, making absolutely sure that the flash was off, but the pizza box is no longer visible. As I write this, the car is still there. This appears a lot like a staked-out cop to me - and I haven't watched any of those fancy cop drama shows on TV for eons. The best thing about it is at least they're not watching me (it appears they may be watching someplace across the creek, thankfully), so best of luck to 'em! Well, this is different than what I usually do, but I was moved to post it anyway. Just imagine what this world would be if everyone, especially here in the U.S., still had to pass a test like this. I might have failed even as a senior in high school. What does this say about the direction of our schools and educational standards? Well, it's actually embarrassing to me and should be to us all - and I think I had a pretty good education, at least through grade school. Granted, this was over one hundred years ago, but so what? Kind of underscores the meaning of all those little things back then that you thought you'd never use again. You may not use those exact equations again, but it trains your growing brain, the one and only one you will ever have. Stay in school, kids. Parents, how would your kids do? Full article here. Thanks Jonco! There hasn't been any one amazing thing happening to us lately to write about. That must mean that it is time to just start typing again and see what comes out. Come along, it might be fun! Our young cats found a new hobby recently. They would climb up on the computer desk and pull out the pushpins holding things up on the bulletin board above and behind the monitor, then bat the tacks around everywhere. It was not fun for us and we were not happy. We had to start leaving the door closed at all times, essentially locking them out if we weren't in there ourselves. Searching for a better solution, I found a cat training device on Amazon that seems to be working well. It has a motion detector and will send out a spray of air to scare the cat away. Easily found if you search, I just don't want to say the brand name here. We have been using it overnights and may use it more during the days while we are at work. They have not pulled down any pushpins since we got this device, I just want to make sure they continue to stay away so we'll keep using it at least for a little while longer. Weather-wise has been pretty normal, though I would like a bit more rain recently. Noteworthy is the very cool weekend we had last weekend. Highs were in the lower 60's, F., very fall-like for just being July at the time. It has been dry enough that I have not had to mow the lawn as much, even skipped the front for about 3 weeks, but there are spots that are browning a bit. Maybe I'll go try a rain dance later. I've declared war on crabgrass. Not so much in my lawn, though there are spots, but in my neighbors lawn, specifically the stretch between our driveway and her house. It showed up in the same area last summer so I sprayed it with crabgrass killer and a few weeks later threw some grass seed down to fill in the lawn. Well, it came back this summer so, again with my neighbor's permission, I have been aggressive about trying to kill it off. So far it is going well and hopefully I can get some real grass to grow before fall. Yes, it is helping my neighbor and I know she appreciates it, but also some of my motivation is that I really don't want it in our lawn. Work has been interesting lately. I wrote some about the layoffs a while ago. I was spared, and will be promoted even. Now even more opportunities are in front of me. Out of a possible 3 options, all promotions, I know which I will take. I'll have a meeting on Monday with some important people then things will be clear and set. I am grateful for these opportunities yet I will be most happy when things settle down and get back to normal. I've been a bit concerned that we are mostly adding green stuff to the compost bin, most of the brown stuff comes in fall. There were no problems last year, but it was not a full year of waste. I know there are additives you can use but I don't think I'll look into that until I suspect we have a problem. This year I may be glad I built it every inch as big as it is.